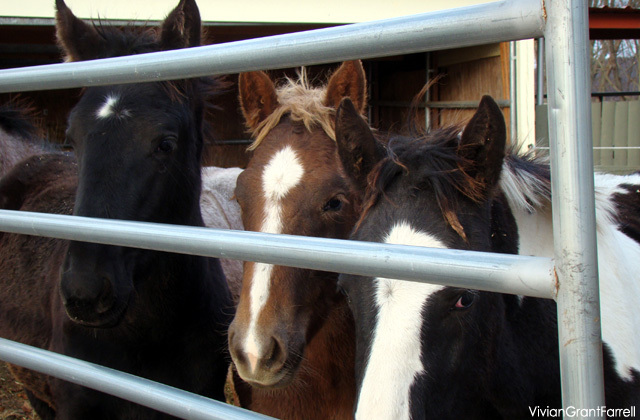 Rescued Premarin foals. Photo: Vivian Grant Farrell. 1. Lobbying the FDA with the help of a specialist firm to return the word “equine” on all Premarin type drugs so it reads “conjugated equine estrogens” the way it did, and should*. 2. Working in China with a massive social media campaign warning women against the dangers of the Premarin family of drugs. This is where most of the horses are and where the largest volume of Premarin type drugs are being used. 3. Leafleting across the U.S. at women’s hospitals and clinics warning women about the dangers of the Premarin family of drugs and educating them on alternatives (expanding into Canada with your help). This work is informative and necessary, and potentially life saving for women and the mares and foals used to make the drug then cast off. Make a donation now in support of this critical work. Tick the box on the landing page to make it a monthly gift. Cancel at any time. We are the only voices PMU horses have. When we remove the demand for these drugs we remove the demand for pregnant mare’s urine thereby freeing the horses. Share this with the women in your life and anyone else who might be exposed to this drug. • Premstoppers campaign page at The Horse Fund website. Thank you for your caring support of women and horses. * A conjugated estrogen can be made from plants. 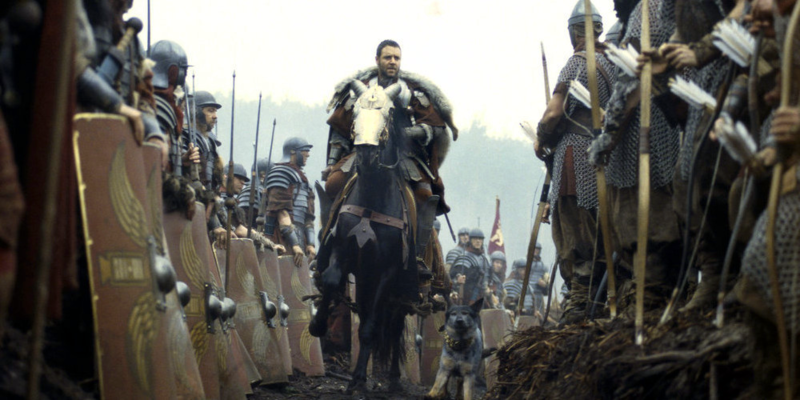 Russell Crowe in Gladiator aboard a horse he became friends with. Russell Crowe and horses on set. How tweet it is. Look! THE DAILY DOT (DailyDot.com) — The Daily Dot reports that Russell Crowe loves horses. We knew that. But particularly horses he makes friends with on set. Check out this tweet. He mentions a couple of them. In a Tuesday morning tweet, Crowe recalled that George, the horse upon which he gave his iconic Gladiator speech in the woods before battle, was also on the set of Robin Hood years later. “We would have a chat everyday [sic],” Crowe wrote. Can horses act? Cutting to the chase, no not in the way humans do or even other mammals. Example: If you want a horse to look and act scared, you need to scare him. This is the bottom line from all the horse handlers we have talked with over the years who train and take part in movies and stage productions with horses. Back in 2004, Kelly Chase wrote a insightful article on this subject. We have it on our “new” website. It’s a good read. Can you believe how old we are? On October 23, we will be embarking on our 16th year defending and protecting horses. Meet and greet horses up for adoption at this weekend’s 2 day AppyFest in Mechanicsville, Maryland. MECHANICSVILLE, Maryland (Oct. 5, 2018) — This weekend, Last Chance Animal Rescue and the Maryland Fund for Horses will host “Appy Fest,” a two-day family friendly festival (Oct 6 and 7) celebrating the rehabilitation and training of some of the 100 plus starving, feral Appaloosa/Quarter horses seized from a farm on Maryland’s Eastern Shore (read their story at DelMarvaNow.com). Appy Fest 2018 is an innovative way to find new homes for horses from large scale cruelty seizures, as well as showcase the horses and their training. Horses are available for meet and greets as well as adoptions at the event, according to a release from Last Chance. Appy Fest 2018 also includes a trainers’ competition, horse adoptions, equine demonstrations, shopping, food, face-painting and pony rides. In March 2018, more than 100 starved feral horses were seized from a farm in Wicomico County. The horses were placed with rescues throughout the Mid-Atlantic area, and since then their recovery has been nothing short of miraculous. Most of the horses have received professional training, preparing them for new adoptive homes. The next stage of their transformation is finding loving, permanent homes. There are several mares who have had foals who are also available for the public to meet and see their training. The two day event will be held from 9 a.m. to 5 p.m on Saturday, Oct. 6., and Sunday, Oct. 7, at Last Chance Animal Rescue’s Eldorado Farm, located at 29844 Eldorado Farm Lane in Mechanicsville (click here for map). Adult admission is $7.50 for both days or $5 for one day. Admission is free for children younger than 10 years as well as seniors and veterans. To purchase tickets, fill out a horse adoption application or to get more info: http://bit.ly/APPYFEST. Note: On the bottom righthand corner of their APPYFEST page, they have a list of hotels offering discount APPYFEST attendee rates. Mention APPY FEST when making your reservations. The Hurricane Cowboy, Patrick McKann, leads two horses to safety who were left behind in rising floodwaters in the wake of Hurricane Florence. Photo by Janet Morgan/Myrtle Beach Herald. HENRICO, VA (WWBT) — He’s been named the “Hurricane Cowboy.” Patrick McKann, of Henrico, is leading an effort to rescue horses, cows and other farm animals left suffering in the flood-torn Carolinas. McKann said so far it’s been a trying mission, but his crew has saved many animals from suffering, including three horses, two donkeys and countless dogs and cats. McKann and his rescue partner, Travis Holstein, teamed up with other livestock animal rescuers from Texas, once they hit the worst areas of the Carolinas. The “Hurricane Cowboys” use an air boat to reach livestock caught in high water. McKann also has multiple trucks filled with supplies like feed and medical kits, donated from the Richmond area, running in and out of the Carolinas. “We had to lasso two wild donkeys,” said McKann. “We’ve seen pigs. We’ve seen cows. We’ve seen horses, chickens, ducks,” said McKann. In photos from the Myrtle Beach Herold, McKann and Holstein mustered through the water — at times up to their chest — to lead three starving horses to refuge in Buscksport, South Carolina. “They were going to drown if we didn’t get to them,” said McKann. Hurricane Florence is McKann’s second rescue mission. During Hurricane Harvey last year, McKann sent down seven supply-loaded trucks to Texas. He stayed in the state, rescuing livestock for a month. McKann said many animal rescue groups are able to help with dogs and cats. However, less volunteers are equipped to help larger stock animals. That’s why the Hurricane Cowboys say they’re determined to reach every animal possible, left in Florence’s wake. “We have good days. We have bad days. We’ve seen a lot of death,” said McKann. McKann fears the worst flooding may still be to come. “The rivers are not due to crest until Thursday or Friday,” he said. That’s why McKann is already sending word for more donations from Richmond, and plans on making repeat trips hauling more trailers full of supplies, for as long as it takes.